This Monday I went to meet Eyad. He has finished his sixth Chemotherapy session a few days earlier. I met Um Eyad and Abu Eyad whom I spoke with last week. The mother looked strong and beautiful. The dad is around 40 and looks decent, extremely polite and sad. 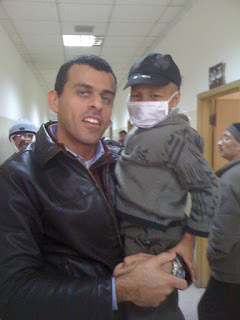 They told me how Eyad started his treatment in Gaza 4 years ago when he was only 2. And because of the embargo on Gaza, little treatment was available. The Palestinian Authority was responsible for the cost of Eyad treatments for the past 4 years. They sent him to Cairo to get his Chemo but the doctors screwed his case and failed to do a special operation. Then the PA sent him to Pakistan where he was subjected to more operations. His cancer cells in his lungs and hip were still high. The PA stopped covering his treatment because the costs were high and unjustified! 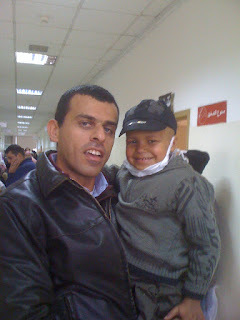 The doctors in Gaza recomended they go to Jordan as the care and medicine is very advanced. The father sold his Taxi cab in Gaza and came to Amman. Israel allowed them to cross to the West Bank and into Jordan. They have been here for 6 months and are expected to stay another 7 months. Thier savings are gone, they have another 1 year old boy (whom I forgot his name now)!! The father wants to work temp to support his family but he holds a Palestinian Authority passport. This is one story of a Palestinian family suffering under severe harsh economical situtaion in Gaza. There are hundreds like this one, who have lost thier lives and homes from the Israeli war on Gaza, the siege and Hamas stupidity!! And today is the 1st anniversary of the Israeli war on Gaza that killed more than 300 children. Today Hamas is still in Gaza, Israel and the world is still punishing the innocent civilians with the siege and embargo. Today powerless Obama is in the office. Today the ailing corrupted government of Abbas is still in Ramallah. But today I refuse the current situation. Because today I was able to help Eyad and deliver donations from Americans in Florida, Jerusalem, England and Saudi Arabia. Donations from Jordanians, Palestinians, Christians, Muslims and atheists!! It’s not the end of the story, Eyad and many like him still need our help, I think this is the least we can do.